Visas - De website van embacr-nl! Comprobar suficientes medios económicos para financiar su estancia turística en el país, que corresponde a US$100,00 por cada día de turismo. Si proviene de alguno de los países en riesgo de fiebre amarilla, debe presentar la certificación de la vacuna. Para más información, presione AQUI. Para obtener una Visa Consular o Restringida para ingresar a Costa Rica, el aplicante deberá completar los siguientes requisitos (copias de todos los requisitos deberán comprobadas). 1. Pasaporte con vigencia mínima de 6 meses y fotocopia de la página de la información). 3. An Application Form (see below on this page). This is an official document, therefore only application forms issued at this Consulate are accepted. 5. Your propose itinerary. It is recommended NOT to buy your airline ticket until your visa has been approved. 7. Proof of solid economic status (bank account statements, salary statements, for the last three months). 8. 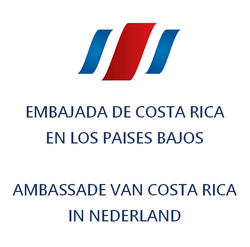 Letter in English or Spanish addressed to the Consul in which you state the following: full name, nationality, passport number, place of residence, length of planned stay in Costa Rica, profession, address in Costa Rica, e-mail address, phone number and signature. 9. Police record, from your country of origin and from The Netherlands issued at least 1 months prior to presenting the application. Documents must be translated to Spanish and apostilled. 10. Birth certificate. Document must be translated to Spanish and apostilled. Consular visa for students or Dutch passports $32 USD. Please indicate ¨for visa application and your name. The Consular Visa is issued by the Consul . Other documents may be required according to the Consul considerations. Once you have all the required documents, please send the copies to the General Consulate of Costa Rica, Laan Copes van Cattenburch 46, 2585 Den Haag. If your application is approved we will set up you appointment in which you should come to the Consulate and bring us all the original documents. They will be reviewed and if they are complete, your visa application will be processed. In cases a restricted visa, when The Dirección de Migración in San José, approved the application, our Consulate will receive a notification from San José , once it will be processed there, and after that, we stamp the visa in your passport. The Inmigration Office will determine the authorized length of your stay. Generally the process takes between one or two months, or more. Once your restricted visa is approved, our Consulate will process it in 2-3 working days. Additional Information: Any document you will show to Migration Authorities in Costa Rica must be translated to Spanish and apostilled.